I’ve written quite a bit about Japan’s Foreign Minister, Seiji Maehara, in the context of his “China-hawk” policies. Youthful, intelligent, agile, sophisticated in the modern diplomatic discourse, but also possessing the clarity and cojones to push/follow the United States into bold, new, and effective paradigms for the projection of military and soft power into East Asia. Or, from a more cynical perspective (which, I confess is the habitual posture of this blog), one might view Maehara as an ambitious politician who has hitched his wagon to hyping the China threat, upgrading the security relationship with the United States, and revising the peace constitution to permit overseas military operations in order to position himself as a pre-eminent neo-liberal hawk. I have an article up at Asia Times, Re-enter the Dragon, concerning the DPJ government’s awkward attempts to deal with Maehara’s efforts to amp up the contradictions between China and Japan. China's unwillingness to cut Maehara any slack extends beyond questions of global strategy and national relationships to matters of internal politics in the ruling Democratic Party of Japan (DPJ). China's designated friend in the DPJ is the "shadow shogun", Ichiro Ozawa. In contrast to Maehara, Ozawa has advocated closer relations with China and a distancing from the US. The DPJ has chosen to cast aside Ozawa, the most effective interlocutor with China, for reasons of policy and politics. After the fall of prime minister Yukio Hatoyama in September, Ozawa lost the contest for DPJ party head (and prime minister) to Kan; however, his disciplined faction in parliament controls almost half of the DPJ votes. Kan and Maehara - who has conducted a strategic vendetta against Ozawa for years - have been united in their desire to reduce Ozawa's influence. Ozawa has been successfully tarred as a throwback representative of Tanaka-style money politics. Maehara and his ally, Katsuya Okada, have been badgering Ozawa to appear before the Diet (parliament) to answer embarrassing questions concerning some piece of fundraising skulduggery. On November 9, Yomiuri reported that 55% of respondents to its poll want Ozawa to resign his Diet seat since a panel has recommended his indictment. Unsurprisingly, the DPJ has consistently expressed frustration that it lacks good channels to Beijing. Cabinet secretary Yoshito Sengoku has tried to establish himself as the go-to guy for China, with little apparent success. China has little motive to enable the political careers of Kan and Maehara as they proceed with the political destruction of China's most important ally within the DPJ. So China may take some satisfaction from the finding that approval ratings for the Kan government have sunk to 35%, driven in large part by widespread dissatisfaction with the government's handling of the Diaoyutai/Senkaku fracas. Kan and Maehara's campaign against Ozawa may have had important strategic consequences as well. It is not unreasonable to assume that Kan's political strategy involved turning to the US to help Japan manage China in a more adversarial way, since it was actively foreclosing the conciliatory route represented by Ozawa. Indeed, it is tempting to interpret Maehara's elevation to foreign minister, and his enthusiastic exploitation of points of antagonism with China, as the Kan government's way of tightening relations with the United States in order to compensate for its institutional difficulties in managing the China relationship alone. It’s important to remember that Maehara served as head of the DPJ while it was in the opposition. He crashed and burned spectacularly when he continued hyping an e-mail alleging dirty money activities by an LDP bigwig even after he knew it was bogus, and had to resign. But he wants to make a comeback, and he probably wouldn’t mind pushing aside Naoto Kan, who represents the more old-fashioned leftwing/labor roots of the DPJ. From Kan’s point of view, putting Maehara into the foreign minister slot to pursue a pro-US policy makes a lot of sense as an anti-Ozawa move. But by letting Maehara carry the flag for the pro-US policy, Kan has also put Maehara in the hot seat because the paramount issue in US-Japan relations—the relocation of the US Naval Air Station at Futenma in Okinawa—looks like it will be a total fiasco. Keeping the base on the island—either at Futenma or a new site at Henoko—is opposed by around 70% of Okinawans. Both candidates for governor have gone on record opposing the continued presence of the base on Okinawa, and they can block new construction at Henoko in a number of ways. If the base issue remains a continued source of friction in U.S.-Japan relations and a bold re-boot onto 21st century terms for the US-Japan security relationship doesn’t happen, Maehara’s political platform and clout would presumably be compromised. As for China, Kan probably does not have the intense commitment to a close relationship with US that Maehara exhibits and, as a more peaceable fellow, prefers to keep relations with China on a more even keel. He already cut Maehara off at the knees by releasing the captain of the misbehaving Chinese fishing vessel back to China when Maehara wanted to try him in Japanese court. And Kan has apparently made it known that he’s not very pleased that he can’t get meetings with Chinese leaders because they are blowing him off to show how much they disapprove of Maehara. However, Maehara is a clever fellow and I wonder if Kan—whose approval ratings are currently in the basement—can outmaneuver him. Maehara also has a potential trump card: the Diaoyutai/Senkaku Islands are administered by Okinawa. 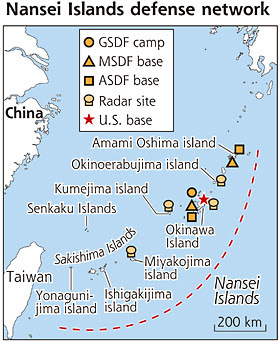 If security friction between China and Japan in the East China Sea continues, maybe Okinawan opposition to US military basing could be transformed into support for Japanese and US military facilities on the island as a keystone of Western monitoring and containment of China. And, in good news for Maehara, continued friction is virtually guaranteed by the heightened attention both sides are eager to give matters in the South China Sea in the aftermath of the fishing boat kerfuffle. The Defense Ministry plans to establish a new military unit to bolster this nation's ability to monitor the Chinese Navy, which has been increasingly active in waters off Japanese territories, The Yomiuri Shimbun has learned. A ministry official said the unit will consist of about 200 Ground Self-Defense Force personnel and most likely be based on Yonagunijima, Okinawa Prefecture, this country's westernmost island. In its budgetary requests for fiscal 2011, the ministry asked for 30 million yen to research the plan, the official said. The unit's main job will be to monitor via radar the movements of Chinese warships in the East China Sea, including the waters around the Senkaku Islands--which are Japanese territory but are claimed by China--and around the Nansei Islands, which stretch across Kagoshima and Okinawa prefectures. The unit will exchange information with the U.S. military, thereby strengthening bilateral security cooperation in the waters. From one perspective, a worthless pile of rocks off Taiwan. From another perspective, an invaluable flash point illuminating the security conflicts between Japan and China. I expect the United States will muddle through its economic and geopolitical difficulties somehow. The US isn’t leaving Asia, China will continue to test the limits of Japanese forbearance in the East China Sea, the political and security conditions for a contain-China policy will remain, and I suspect Seiji Maehara isn’t going anywhere either.